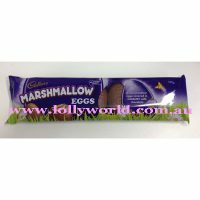 Cadbury Marshmallow Eggs 6pk are Cadbury Dairy Milk covered marshmallow from New Zealand. A classic Easter treat made with Cadbury milk chocolate. Each 150g packet contains 6 eggs.